In Chapter 1 we introduced the basic information elements that you can access via the EHRI Portal. In this chapter we will explain how these elements are structured and inter-linked with each other. Understanding how the Portal is structured can often save a great deal of time and effort when trying to search for specific documents. It is important to note that the labels given to the different levels of archival descriptions are arbitrary. 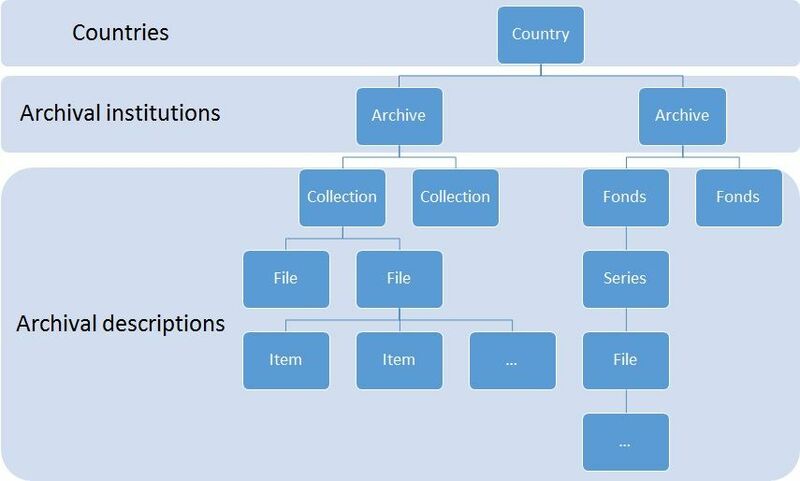 While one given archive may organise their holdings into collections which are composed of files with several items, another one might think of their holdings as consisting of fonds, organised into series and files, etc. The portal is designed in such a way that you can make use of these structures to browse through its information. For instance, you may start your exploration by selecting the country in which you are mainly interested. From the description of this country you can then browse through a list of all its institutions that EHRI has identified to hold Holocaust related archival holdings. The descriptions of these institutions may in turn help you to select those institutions that are most likely to hold materials relevant to your research. Browsing through the archival descriptions of these institutions, finally, will lead you to the most relevant collections. Chapter 4 below, provides a detailed and illustrated example of how you may go about browsing the portal in such a way. These hierarchies provide the basic structure of the Portal. However, access points taken from controlled vocabularies can introduce further horizontal relationships. For instance, if two collections held by two different archival institutions from two countries both deal with “Refugees”, this connection may be expressed in the Portal by both having that term as a subject access point. Likewise, two other collections may be related due to the fact that both were created by the same organisation (say, the “United Nations War Crime Commission”) - a shared provenance that is being made explicit by both collections being related to the description of this UN Agency in the list of EHRI corporate bodies (see diagram below for a graphic illustration). The other EHRI vocabularies serves to create further such horizontal connections. Such relationships via controlled vocabularies are a powerful tool. For instance once you have located an archival description that is relevant to your research, you may be able to easily locate several other potentially equally useful ones with one click thanks to the connections introduced by controlled vocabularies. We will be explaining how you can do this in more detail in Chapter 8 below. Again it is important to note that currently there are a very limited amount of archival descriptions have been connected to the EHRI vocabularies. We are currently working hard on implementing the EHRI vocabularies more comprehensively, and we expect to have a much improved coverage in this regard by the end of 2018. Some archival institutions – for instance Yad Vashem, the United States Holocaust Memorial Museum or the International Tracing Service – have over the years assembled big copy archives – that is to say they have photocopied or digitally reproduced archival collections that are held in original in many different archival institutions across the world. Whenever the Portal contains a description of an original collection as well as of one or several copies of the same collection held elsewhere, we try to establish an explicit links between these descriptions. Having information about the existence of copies and originals readily at hand can be very useful. Indeed, it may be that for a given collection access to the copy collection is easier for you because, say, the copy-holding institution is geographically much closer to you than the institution that holds the original. Or the case may be that you are interested in an archival collection that is written in German, but the original collection is held by a Polish archive and, therefore, described in Polish. However, a copy of this collection held by Yad Vashem might well be described in English. 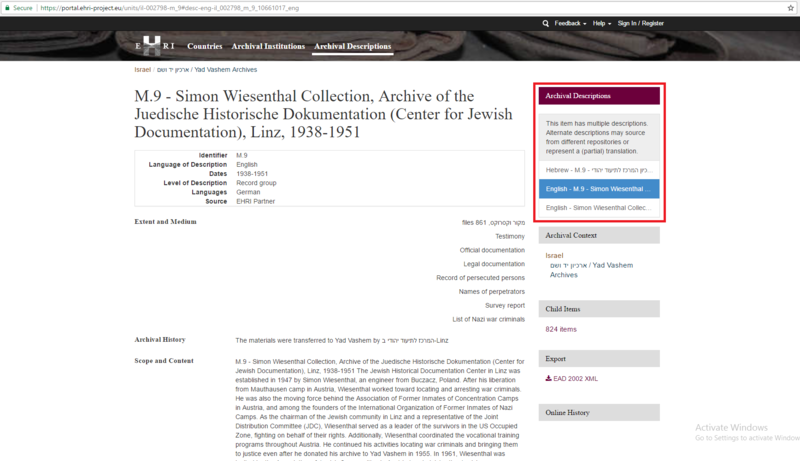 If you are able to read German and English, but not Polish, convenient access to the Yad Vashem description will enable you to evaluate whether this collection is relevant to your research. However, as with linkages to controlled vocabularies another warning is necessary: thus far, only a limited amount of copy-original collections have been linked together. As each one of these three descriptions may contain vital information that is not reproduced in the two others, we have made it easy for you to switch between them by clicking on the relevant links in the box highlighted in the screenshot above. Having an understanding of the structure of the EHRI portal will help you to find information more easily, and assist you when exploring and navigating such information. However, before guiding you through the Portal’s search and browse functionalities in chapters 4-7, a few words are needed on how countries, institutions and holdings are identified, and how information is sourced and integrated into the portal.